Does Dealcoholized Wine Have Health Benefits? It appears that dealcoholized wine might have some health benefits, but it's difficult to know for sure because most studies are done with regular wine. Even though dealcoholized wine doesn't have all the alcohol of regular wine (typically around 13-14 percent by volume), it should have about the same amount of polyphenols that are the natural plant chemicals found in the skins of grapes (as well as other fruits, vegetables, nuts, and seeds). These chemicals act as antioxidants that may protect your cells from free radical damage. Red wines have more of these polyphenols than whites because the grape skins are removed before making white wines. 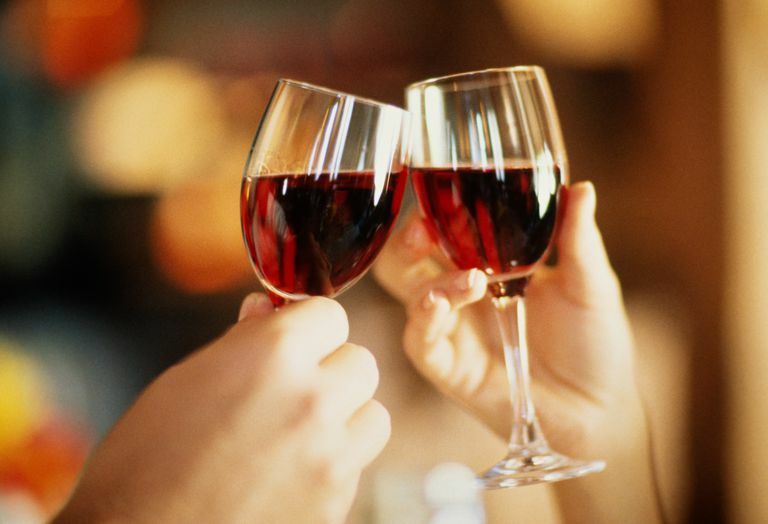 There aren't any studies that indicate drinking dealcoholized wine will reduce your risk of any particular diseases. But there is some research on how it compares with regular red wine for blood concentrations of some of the polyphenols and how they affect some of the biochemical markers that are associated with cardiovascular disease. These studies indicate regular wine has a bigger effect, but dealcoholized wine does improve some of these markers as well. Of course, there's more to consider than the antioxidant potential. The dealcoholized wine has fewer calories than red wine (about 1/4 to 1/3 the calories, according to the winemakers), and you won't run the risk of consuming too much alcohol. Dealcoholized wine starts out as real fermented wine, but before it's bottled, it's either filtered or put through a spinning process that removes both the water and the alcohol. Next, the volume is replaced with water or a combination of water and unfermented grape juice. How does dealcoholized wine taste? I would guess that most oenophiles would struggle with the difference because alcohol contributes significantly to the body, bouquet, and flavor of wines, both red and white. The white dealcoholized wines are a little closer to their fully alcoholized cousins, but if you love a big, full-bodied Cabernet, it may take some time to adapt to the weaker flavor of the dealcoholized version. But, on the other hand, it doesn't taste like grape juice either. A dealcoholized red wine still has a hint of the tannins, and it isn't as sweet as plain juice. Please note that even though dealcoholized wine is essentially alcohol-free, you should still speak to your health care provider before consuming it if you are pregnant or have been told you need to avoid alcohol. Brown L, Kroon PA, Das DK, Das S, Tosaki A, Chan V, Singer MV, Feick P. "The biological responses to resveratrol and other polyphenols from alcoholic beverages." Alcohol Clin Exp Res. 2009 Sep;33(9):1513-23. Chiva-Blanch G, Urpi-Sarda M, Llorach R, Rotches-Ribalta M, Guillén M, Casas R, Arranz S, Valderas-Martinez P, Portoles O, Corella D, Tinahones F, Lamuela-Raventos RM, Andres-Lacueva C, Estruch R. "Differential effects of polyphenols and alcohol of red wine on the expression of adhesion molecules and inflammatory cytokines related to atherosclerosis: a randomized clinical trial." Am J Clin Nutr. 2012 Feb;95(2):326-34. Modun D, Music I, Vukovic J, Brizic I, Katalinic V, Obad A, Palada I, Dujic Z, Boban M. "The increase in human plasma antioxidant capacity after red wine consumption is due to both plasma urate and wine polyphenols." Atherosclerosis. 2008 Mar;197(1):250-6. Should You Eat Salmon as a Healthy Addition to Your Diet? Do You Know How Healthy Chia Seeds Are? Is Corn a Healthy Food Nutritionally?